This chameleon-like, moldable plastic card is a hot water bath away from being whatever you want it to. 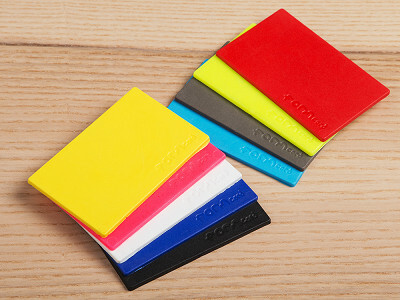 Made from a reusable bio-plastic, FORMcard starts off as a slim sheet with the potential to transform into a daily problem solver. It slips inside a pocket or drawer and activates when you put it into a cup of boiling water so you can mold it into just about anything. We’ve seen it—or even just a piece of it—morph into a whole range of hacks from phone stands, to tool handles, to missing buttons and more! 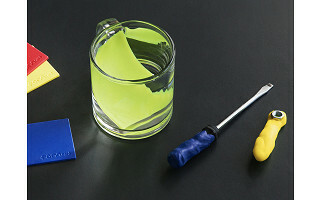 Maker Peter Marigold had experience working with rubber, and knew the properties of this kind of bioplastic made it perfect for household repairs. So long as you can boil water, you can transform FORMcard. Get imaginative and keep reusing it to suit your daily situations and create a new invention every time. Hi. 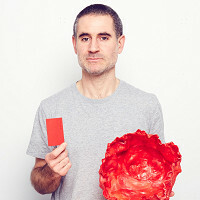 I'm Peter Marigold, the creator and founder of FORMcard. I'll be happy to answer all of your questions about this handy product. Good Morning. How strong in this once it hardens into whatever you make of it? Meaning if I make a repair of an umbrella and it's cold and windy will it crack? I was also wondering how many times you can remold it before it starts to lose it malleability? A key thing to remember is that this is a starch based bio-plastic and as such it will bio-degrade if it is placed into soil. Therefore it's a good idea to avoid making plant pots! @Peter Thank you , looks like a great gift for DIYers. Is there a limit as to how many times it can be reused? (1) Is there a limit to how many times the card can be remolded? (2) Are any chemicals released on the surface of the card after it's been heated? @Steve Hi Steve (please see my answer for Lori above re. remolding). FORMcards are totally non-toxic and use a bio-degradable polymer. We have full US LHAMA certification which I am happy to provide if needed. I assume it's more the temperature of the water versus the water itself that makes it pliable? I'd like to use it in a car molding application, but worry that a hot summer day would undo my repair. True? @Philip Hi Philip - you are correct it is temperature rather than water affecting the polymer. We would recommend not using FORMcards in situation where things get very hot - basically close to boiled water temperatures. N.B. your observation does remind me to say that to activate FORMcards you can also use a hairdryer or heat gun if needed. @Peter Philip - we have actually had several FORMcard users make successful fixes on things on there cars - e.g. broken wing mirror surround, and so this is a good question! It kind of depends where in the USA you are - Texas or Alaska! If the product is cut, can the pieces be rejoined &/or can 2 or more pieces be molded together for larger projects? @Margaret Smart thinking Margaret! That's exactly right yes, you can fuse cards together to make larger sheets, let them cool down and then heat them in a larger dish to mold them for a larger project. We had some people do some very cool things by layering up different coloured cards for projects also! Rainbow stripe projects. I was wondering the same thing. How long until it hardens back up? It takes about 2-3 minutes depending on the thickness and room temperature. I work with it with a cold water bowl on hand also to refine elements - then reheat them in another bowl. @Peter Thanks. What about the temperature right after it comes out of the boiling water? Need to be sure it's safe for the kids to handle. @Gerry Absolutely. If working with hot water I would only suggest doing so with an adult around. After a few seconds handling the FORMcard it is easy to handle, but please use great caution. Safety instructions are noted on the packets also. Does it come with instructions? That is, if I send it to my son-in-law across the country how will he know what to do with it? It looks like such a great idea! @Sharon Hi Sharon, yes indeed - Packs of FORMcards come with full instructions. Do the colors combine? For example, if I were to use a yellow and red one together, will the yellow and red stay separate colors, no matter how much I "mash" them together, or would I eventually get orange? @Patricia Hi Patricia, it's great fun to play around with mixing colours. Yes they will totally blend together if needed. I quite like to play around making twisted colours - you can get some really nice effects on projects if you work by combining them like this. But yes - if you do need an exact colour mix you can also blend them until they are a perfect match. You can make up the colour and then reheat the result to apply to your project. Interesting invention you have here! I test and then recommend products that are useful in emergency situations, be that a car breakdown on a cold night or something more drastic. (Like an earthquake where services are out for a very long time.) So I have a bit more experience with this sort of thing- I can see lots of emergency uses, but I am curious about the memory of the plastic. What I mean by that is, if I heat and bend the plastic into a particular shape and allow it to cool, will it return the the clean, card like, uniform shape of the original product if I heat it again? That's not necessarily a bad thing if it can't, but just curious. Example: You molded one into a handle for a screw bit. If you dropped that back into hot water, would it then return to its credit card original shape? Thanks Peter for bringing this to market- it's kind of like duct tape that won't lose its shape! @Jeff - I just saw this in my email from The Grommet. Great idea and great job. No, the material does not have a memory at all. Once blended with heat into a new form it will assume this new form entirely. If you try and bend it by hand when COLD it does have a degree of strength like nylon and so will want to get back to that shape. But yes, heat will totally reorganise the polymer into the new form each time. It is oil resistant - it's good for making emergency funnels for decanting mineral spirits and things like that (I've been there!). I don't mean any offense to Jeff, but if you are somewhere that you can boil this, you could probably find a different fix for a fuel line. Also, it probably does not have a memory. That card shape it comes in was probably formed while it was warm. Plastic doesn't conduct electricity. Most plastics (and other materials) become less flexible (more brittle) as their temperature decreases. @Steve Not necessarily, one could lay it upon the side of a warm engine and then wrap it around a hose or a wire with insulation frayed. Again, as an emergency fix. I have been on the side of the freeway and wished I had shrink wrap when my lights shorted. Lot easier than tearing out the cabin light wire and splicing that into the frayed section- and using your teeth as wire cutters\strippers, lol. That happen in an old delivery van I drove- my teeth still hurt, lol. Peter, useful and fun product. Great invention. @Hugh Thanks Hugh. Appreciate this comment. I had the top of a car key (the hole you use to put it on a keychain) break off. Could this be used to mold onto the key and make it usable on a keychain again? Would it adhere to the original key? Formcard will not fuse onto metal - which makes it handy for making things like tool covers on sharp objects - weird shaped chisels and things like that! Is the material food-safe? Will it break down if exposed to wet food for any duration? I would like to use it to adapt a squeeze container to accept a different cap. The food that would go into the container is honey, if that matters. @Sarah Hi Sarah, FORMcard is totally non-toxic, however we currently have it labeled as 'not for internal use'. This looks very useful and I was wondering if there are things it will NOT stick to WRT to repairs. There is another product (Sugru) out there that can be molded and will harden but it does not stick to certain types of hard plastic. I know this because I have been trying to fix a small area on a vacuum cleaner that is made of hard plastic. Can you tell me what it will and won't adhere to. @Denise Hi Denise, I love Sugru and use it for all kinds of things! But it has totally applications. 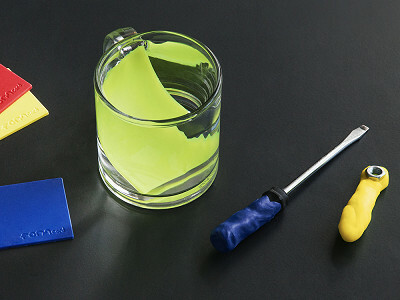 Sugru is rubbery and glues to everything - it's also slow curing. FORMcard sticks (almost) exclusively to some plastics (it also sticks to wood if squashed on when really hot). It's a good idea to test things out before you embark on a project. I'm happy to try and answer specific project questions. If you can get the receiving object quite warm (with a hairdryer for example) before hand it helps. FORMcard is instant to use - which makes it great for emergency quick situations - or even when out and about such as fixing your luggage when on holiday. Do you know what the dielectric strength is? I'm thinking this would be perfect to coat wrenches to make them safe from accidental shock hazards. @Peter An outside sheath for closed end, or box, wrench; like a coat of paint. @Steven You learn something new everyday! Steven, although I can imagine something like that might work, I cannot recommend it for such use as this a very critical item - high voltage industrial tools should be use for this situation! How is this different from Friendly Plastic? Does it stick to itself? @Sharon Hi Sharon, as I mention in the video, low temperature thermoplastics have been around for a very long time, I have tried to introduce them in the most user friendly format possible. 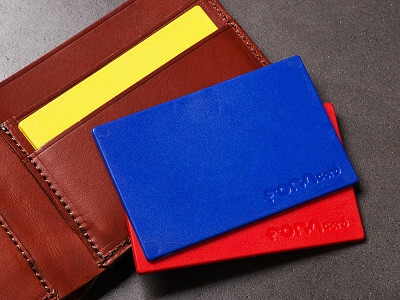 FORMcards are designed to fit in your wallet and in a cup of hot water, they are just the right size and thickness for the everyday fixes that they are need for. Yes, they do stick to each other - you are able to make vivid colour combinations also which look very cool. @darell Thank you Darell! Yes, I do like it as a compliment to Sugru. FORMcard sticks only to some plastics (and mechanically to both wood and fabric). Therefore it is good to use for things like removable clips and hooks, covers and things like this. Mechanically you can make it attach to pretty much anything! That is, if you mould it around something it will keep that shape when cool..... if you get the hang of this you can make clever little springy clips for holding things like..... your favourite crystal collection on the wall! FORMcards are super strong - for the screwdrive in the movie it's just fused around the screwdriver bit - it's strong enough to handle that kind of thing! A tip: there is a common tendency I've noted in people making accurate items like the screwdriver where the tight fit is important, to keep fiddling with the material until it's cool and hard - DON'T! Mould it into shape and then let it cool down - any wiggling as it goes cool will simply create looseness. I'm happy to talk through any applications you might have in the future. We have a ton of projects and suggestions. Can FORMcard be painted? If so, is there a particular type of paint (latex, acrylic, etc.) that works better than others? Also, much of the information focuses on re-using the material. Can it be used as a permanent fix for a non-weightbearing item? @James Hi James - yes it can! You can prime with standard plastic primers and then work with anything on top. Yes, you can certainly use this for permanent solutions. Also for weight bearing situations! As long as it is not reheated or buried in the ground it will stay as good as it was when formed. This is a such a cool tool for problem solvers! I'm wondering: if you want to use a smaller piece for a tiny application, would you cut the card before heating, or heat and then remove a small piece of the plastic? Hi Peter! I love this idea. Would FORMcard work to repair a hole in glass? I'm in need of something that could create a water tight seal over a hole in a glass vase that's smaller than a quarter. @Celeste Hi Celeste..... weirdly I have actually done things like this! So.... it's a little bit tricky as for totally sealing (watertight) glass you should use a silicone - which will fully glue onto the glass. 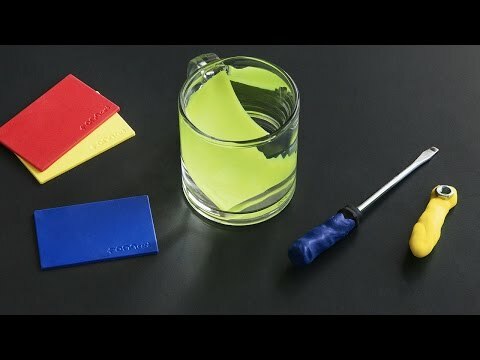 If needed you could squash (bridge) the hole with FORMcard by squashing it from both sides, and then when cool seal the outside carefully by wiping a very thin amount of silicone around the FORMcard material. It's a bit fussy, but if the hole is irregular this might actually be a clever fix.